I don’t think anyone could have predicted that in the twenty-first century the old doctrine of Calvinism would suddenly experience a great resurgence. Yet this is exactly what has happened. The New Calvinism, or the Young, Restless, Reformed, has been highlighted in platforms as diverse as Christianity Today and TIME as one of the ideas that is changing the world today. It has been a major emphasis in publishing and has its own celebrities, conferences and organizations. Note: We don’t expect that you will agree with everything we’ve chosen to include and exclude. Also, while the timeline is roughly chronological, individual events within a particular year may not be in the exact right order (so, for example, Chosen By God may have been published after Desiring God, though both were published in 1986). 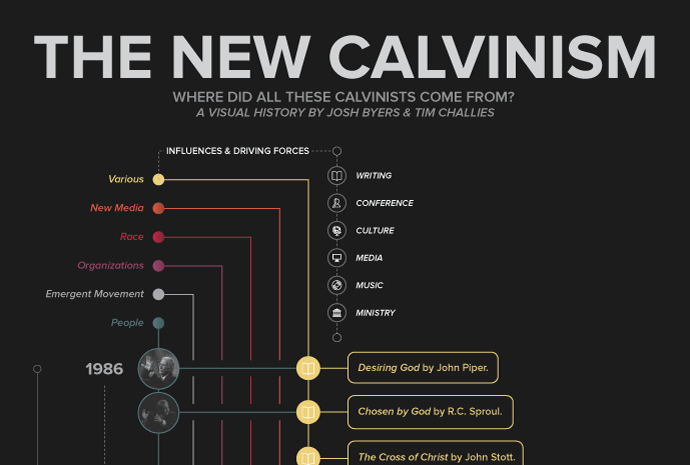 Where Did All These Calvinists Come From?